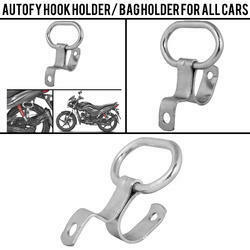 Wholesale Trader of a wide range of products which include autofy 3d, 4d, 5d & 7d mats for all cars, autofy headlight assembly for all bikes, autofy drink holder/ cup holder for all cars, autofy bunjee net for all vehicles, autofy bujee ropes for all two wheelers and autofy hook holder/ bag holder for all cars. 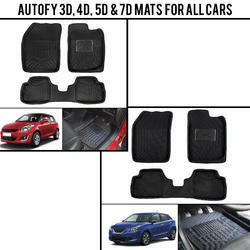 Autofy premium quality mats are available at reasonable cost & prices. These mats comes with multiple layers of material which provides it the required stability along with the quality of protecting your car against dirt, water, mud etc. and can endure heavy impacts of your leg under every circumstances. 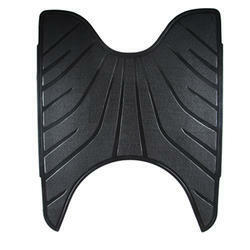 These mats are highly durable and functional which improves the appearance of your car manifolds. This mat by Autofy comes good quality rubber that helps in keeping the mat in place under normal and intense riding scenarios. Even after having a tough and durable material, cleaning this mat is not a heavy task for anyone. The entire surface of the mat can be easily cleaned with soap or regular water which makes is convenient and easy to clean accessory for your car. These mats are easy to install and gets perfectly fitted in your car due to its thick raised edges and leaves no room for dirt and particles to reach your car. The premium quality material used in these mats is 100% waterproof, Non-toxic, Environment friendly and does not produce unpleasant odours as well. Its non-sticky surface remains slip resistant even after getting wet and provides firm grip to your toes. By its amazing quality and design, this mat adds a dashing and stylish touch to the vehicle and will certainly improve the interiors of your car. Along with this vehicle, Autofy mats are available for other cars as well which gives you the opportunity of choosing from big pool of quality products at best prices. Autofy Headlight is available at reasonable and pocket friendly prices. This headlight is made up of premium quality plastic that gives it ample amount of durability and toughness. Due to the plastic as a base material, this light manages to maintain its light weight and can be easily installed in the bike with no discomfort. Glossy reflector provided inside the headlight reflects sufficient amount of light and gives maximum visibility. The specially designed curvature helps in getting a spot focused light and gives converged visibility. Not just that, this headlight provides long light beam distance which enables you to achieve wide area visibility. 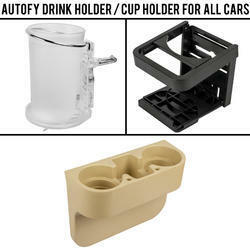 Autofy Universal Drinks holder for All Cars is available at reasonable and pocket friendly prices. This holder will let you to keep your drinks in place even while driving. It is very easy to install and operate. It is made up of premium quality plastic which gives it the required durability and strength. This drinks holder by autofy is 100% waterproof and can be easily cleaned with the help of a damp cloth. This can be used on any car and will be better choice for Etios Liva, Fortuner, Innova, Land Cruser LC200, Land Cruser Prado, Prius, Beetle, Jetta, Polo, Vento, Octavia, Rapid, Superb, Yeti, Duster, Fluence, Koleos, Kwid, Lodgy, Pulse, Scala, Micra, Micra Activa, Sunny, Terrano, Pajero Sport, Aventura, Punto Evo, Linea classic, Linea classic, Force one, Ecosport, Endeavour, Figo, Figo Aspire, Amaze, Brio, City, CR-V, Jazz, Mobilio, Creta, Elantra, Eon, Grand i10, i10, i20 Elite, Santa Fe, Verna, Xcent, Bolero, Getaway, KUV100, Quanto, Ssangyong Rexton, Scorpio, Thar, TUV300, Verito, Verito Vibe etc. 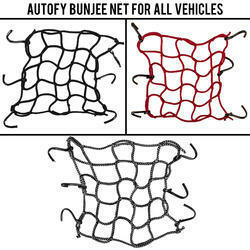 Autofy Universal Bungee nets are available at reasonable and pocket friendly prices. This product will help you to keep your belongings in place while riding due to its super strong net that properly holds the product and prevents it from falling. This bungee net comes with 6 durable hooks that gets properly attached to your vehicle and keeps the net and your belonging in place even while driving on rough roads. These hooks are covered with premium quality plastic so as to protect your bike from scratches at the time of loading or unloading of goods. This is a highly recommended product for bike enthusiasts, biker lovers and biker boys who love their bikes Royal Enfield Bullet Standard 350, Royal Enfield Bullet Standard 500, Royal Enfield Bullet Classic 350, Royal Enfield Bullet Classic 500, Royal Enfield Bullet Classic Desert Storm, Royal Enfield Bullet Electra, Royal Enfield Bullet Thunderbird 350, Royal Enfield Bullet Thunderbird 500, Avenger, Pulsar, Duke KTM, Harley Davidson, Yamaha FZ, R15, CBR, Ninja, Apache, Hayabusa and other bikes. 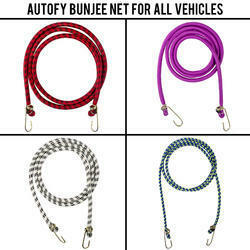 Autofy Universal Bungee ropes are available at reasonable and pocket friendly prices. This product will help you to keep your belongings in place while riding due to the super strong rope that properly holds the product and prevents it from falling. At the ends of the rope, strong and durable hooks are given so that you can attach this rope anywhere, as per your need. These hooks are covered with premium quality plastic so as to protect your bike from scratches at the time of loading or unloading of goods. This is a highly recommended product for bike enthusiasts, biker lovers and biker boys who love their bikes Royal Enfield Bullet Standard 350, Royal Enfield Bullet Standard 500, Royal Enfield Bullet Classic 350, Royal Enfield Bullet Classic 500, Royal Enfield Bullet Classic Desert Storm, Royal Enfield Bullet Electra, Royal Enfield Bullet Thunderbird 350, Royal Enfield Bullet Thunderbird 500, Avenger, Pulsar, Duke KTM, Harley Davidson, Yamaha FZ, R15, CBR, Ninja, Apache, Hayabusa and other bikes. 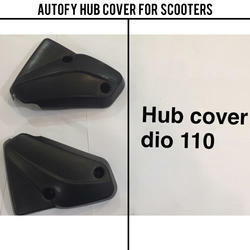 Autofy hub cover is available at low and pocket friendly prices. This will help you in improving your bike looks and appearance manifolds. This autofy product is made up of very durable yet light weight material. These will enhance the functionality and appearance of your vehicle and will work as a companion of for your bike. These hub cover are the best quality products and are available at the best prices this season. 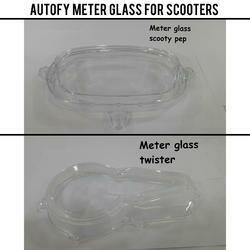 Autofy meter glass is available at low and pocket friendly prices. The material used manufacturing this product is highly durable and comes with a light weight body. Due to its specially designed body, this will make a perfect with your vehicle. Due to its transparent body, you will be able to see the speedometer easily and without any discomfort. It is very easy to install and does not requires much time and expertise for the same. 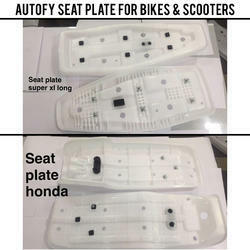 Autofy seat plate is available at low and pocket friendly prices. The material used manufacturing this product is highly durable and comes with a light weight body. Due to its specially designed body, this seat plate will make a perfect with your vehicle and will properly hold the seat of your vehicle. Proper grooves have been provided on this product that perfectly fits the seat of your vehicle in every riding conditions, be it on road or off road. It is very easy to install and does not requires much time and expertise for the same. 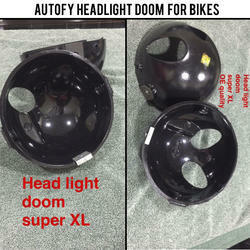 Autofy Headlight doom for bikes is available at reasonable and pocket friendly prices. This headlight is made up of premium quality material that gives it ample amount of durability and toughness. Due to the premium quality material, this light doom manages to maintain its light weight and can be easily installed in the bike with no discomfort. Glossy reflector provided inside the headlight reflects sufficient amount of light and gives maximum visibility. The specially designed curvature helps in getting a spot focused light and gives converged visibility. Not just that, this headlight provides long light beam distance which enables you to achieve wide area visibility. 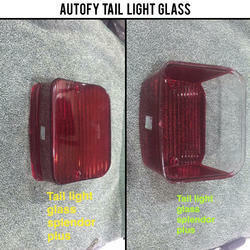 Autofy Tail light glass is available at low and pocket friendly prices. The material used manufacturing this product is highly durable and comes with a light weight body that will enhance the rear looks of your bike manifolds. This product can withstand riding impacts easily and due to its transparent body, the light of the tail light of your bike is not hindered. Along with providing safety to the tail light of your vehicle, it also helps in enhancing the looks of your vehicle and provides you and your vehicle the opportunity of coming under the spotlight.Due to its specially designed body, this light will make a perfect with your vehicle. It is very easy to install and does not requires much time and expertise for the same. Available at a very reasonable price. This mat is bound to stay with your vehicle for years to come owing to its incredible strength and flexibility that comes from highest quality PVC used in the manufacturing of this product. The material used not only renders longer life to the product but also gives a rich finish to it. With the purpose of retaining the characteristic shine of PVC, the colours are not painted after the manufacturing but mixed into the PVC while it is a molten state. This process also preserves the flexibility of the PVC plastic. Owing to the flexibility of the material the mat does not tear apart or break even when subjected to extremely high and low temperatures and. This feature also enables the mat to preserve its shape and size over a long period of time. Autofy PVC plastic foot mats feature attractive designs and patterns engraved over them that not only give it excellent look playing an instrumental role in enhancing the look of your two wheeler but also enhance the friction in between the mat and the objects placed over it. Hence, not only does your bike look good but also the risk of accidental slipping is reduced considerably. Your stock foot mat can directly be replaced with better performing and better looking Autofy PVC plastic foot mat owing to its exactly similar size and fitments as those of the stock equipment.